…and perhaps even more so in a small town. And we know Jimmy, or Jim, as everyone else calls him. Jim and my brother worked together, so Jim has been here for decades. 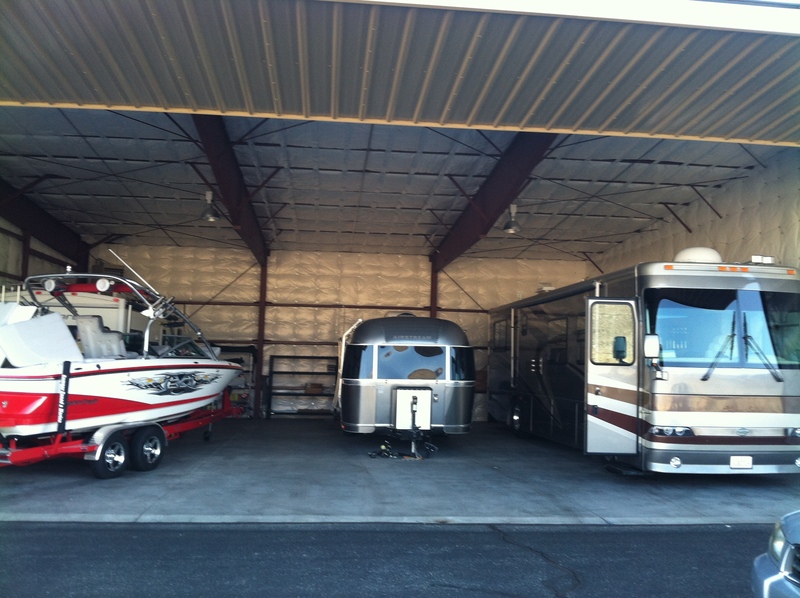 One of the deals with a trailer is you need a place to store it. It seems like no big deal, but it was a big deal and a cause for stress because we did not have a place to store her up here because everyone was full! So it looked like Bishop was going to be her home. Not exactly convenient, and I wasn’t thrilled about her sitting outside in 100 degree heat. Stress relieved, problem solved! Now comes the good part. Jimmy also knows a couple that has two hangars at the airport, and he thought maybe they were looking for a tenant. 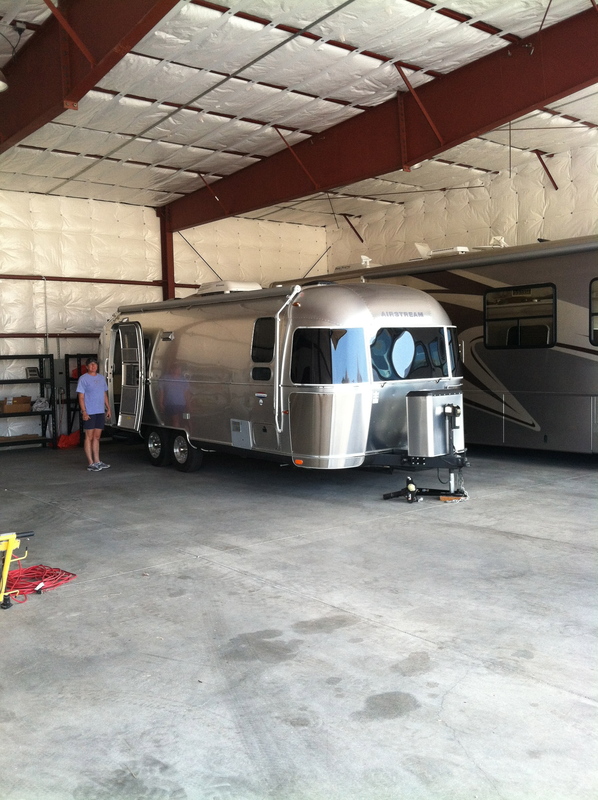 He passed along their phone number, we did a meet and greet at our Airstream. The next thing I knew we were at their hangar striking the deal. And as you would expect in a small town, all on a handshake! 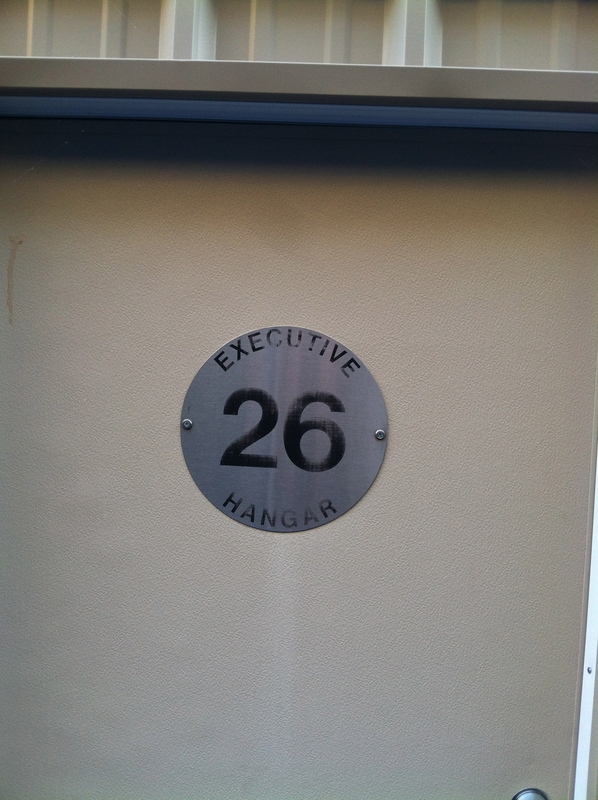 The icing on top of the cake, the couple that owns the hangar are super nice, so now we have one more connection in town. Her first home. Happy to have a spot, but concerned about lack of security and the elements. Her new home. Can you see the difference? View of Mt Morrison and Laurel Mt from the hangar. Not to be confused with Hangar 24, the beer guys out of Redlands. On May 8, 2004, we lost a very dear friend, Hans Wichary. He was hit head on while riding his road bike. Amelia, ever since, has been really freaked out about biking on roads. And really, really freaked out when I do it. My desire to be a roadie has never been strong, especially living in the city. 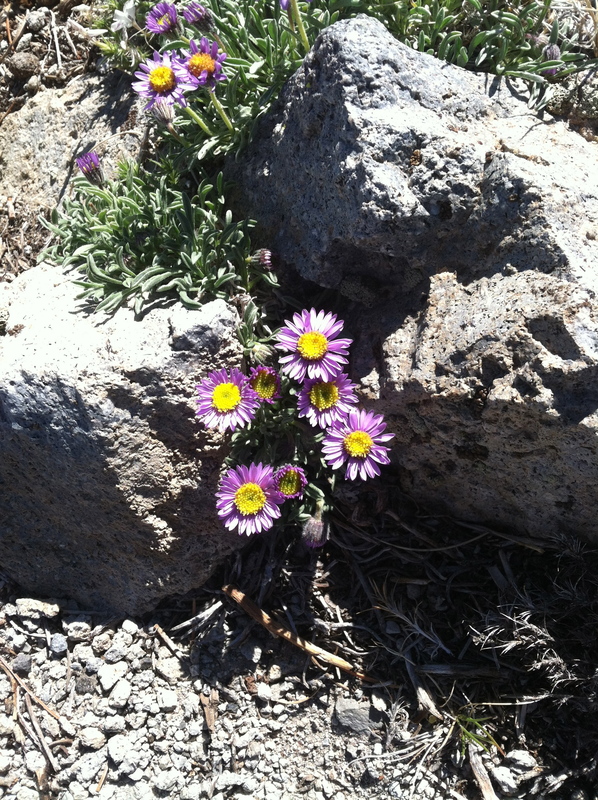 But in Mammoth….I kind of have the desire. 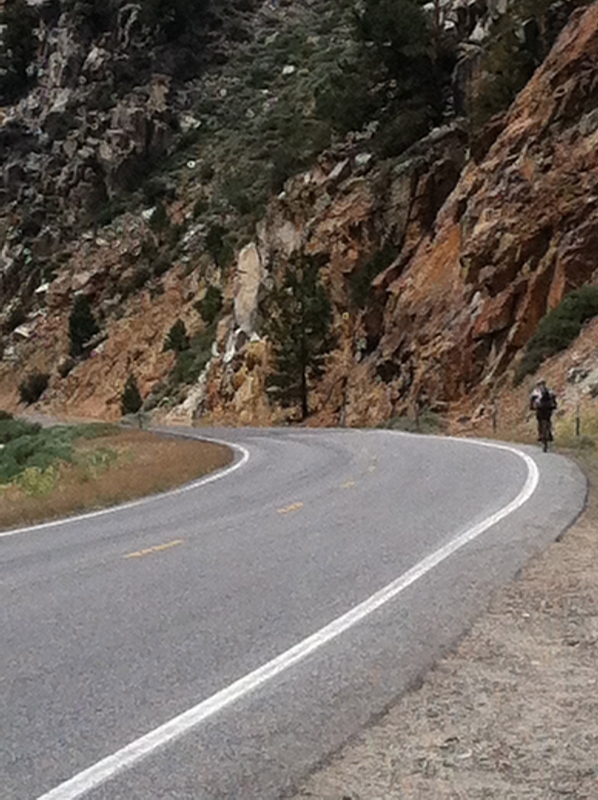 The traffic is minimal, the scenery beautiful, and what excites me are the epic climbs. 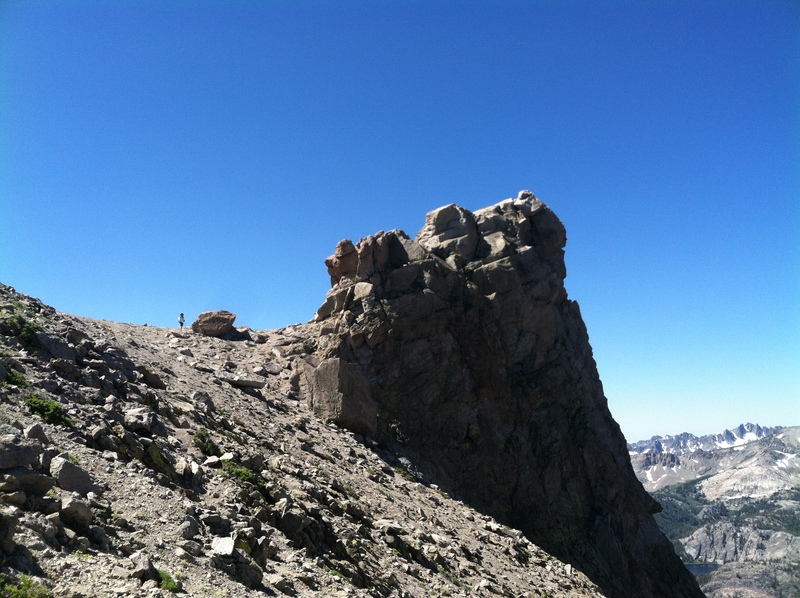 There will probably be many that will disagree with this statement, but in my opinion the cross country mountain biking isn’t that great in the Mammoth area. This is also driving my desire to get on the roads. 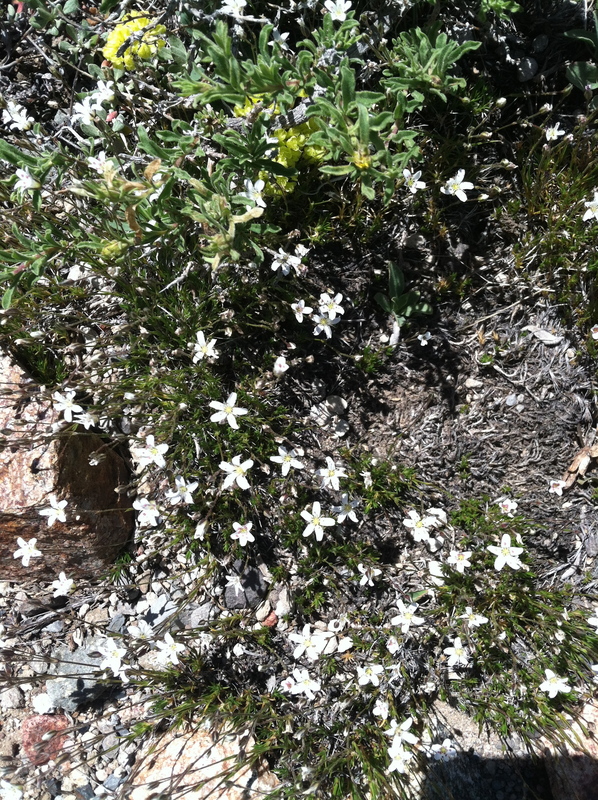 In the SD area, there are many great mountain bike rides, in varied terrain: The Tunnels, Sycamore, Mission Trails, The Weed Patch aka San Clemente Single Tracks, Daley Ranch, Noble, Cuyamaca, Laguna, Hodges, Elfin, Black Mtn/Miner’s Ridge, Meadowbrook, Anderson Truck Trail, Hurkey, Pines to Palms, and Goat Trestle, just to name several! Eventually I will get a road bike, but for now I’ll be that nut you see on a single speed mountain bike in a cotton t-shirt! 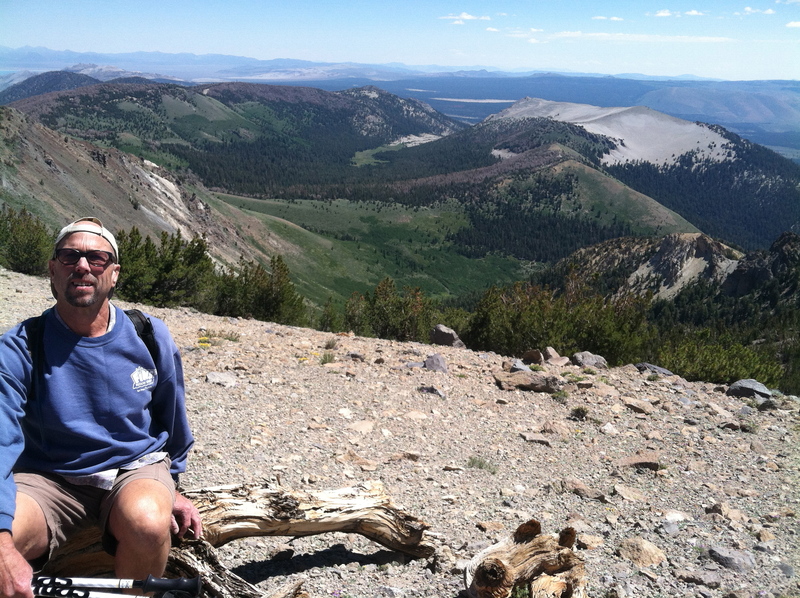 On the morning of Thursday July 11th we were hiking Panum crater in the Mono Basin. 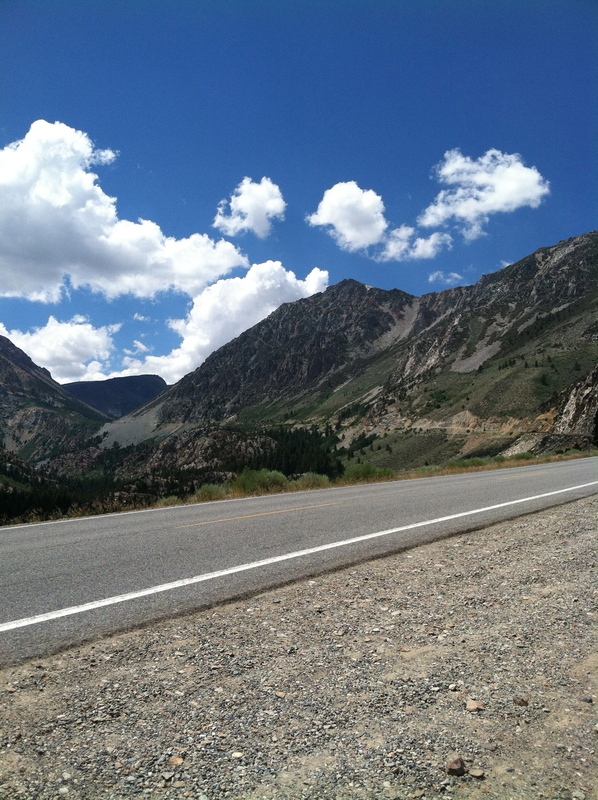 Amelia knew I needed more, and out of character she said, “Why don’t you bike Tioga Pass, I’ll sag for you.” “Really? !” I jumped on the opportunity! Usually I’ll plan a big ride, and then spend days visualizing it. This was going to be an extra challenge because I hadn’t had time to wrap my head around it. 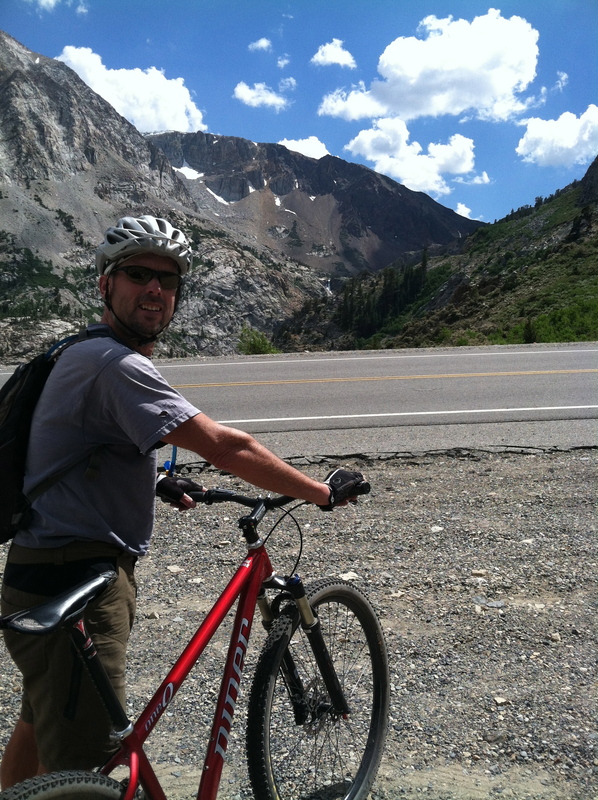 The goal this year is the Horseshoe Meadows ride. Here are the specifics of that ride. 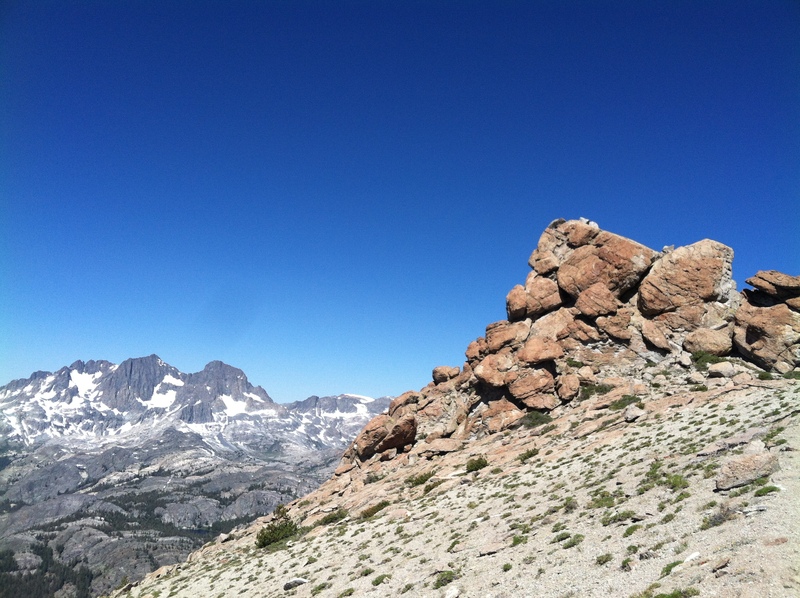 Start in Lone Pine at 4,000ft elevation, climb 6,000 ft in 22.5 miles up Horseshoe Meadows road, elevation at the top 10,000ft. So Tioga is kind of a tune up. 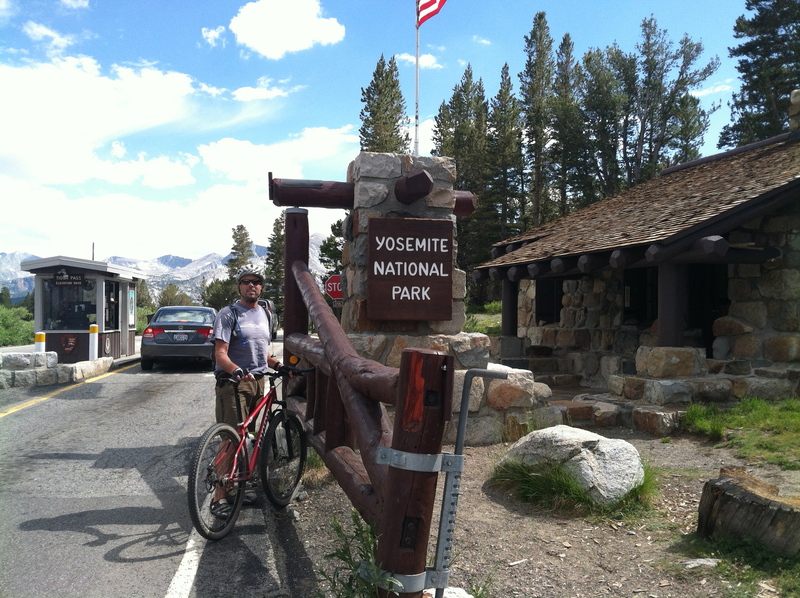 Start at Lee Vining, elevation 6772 , climb 3173 feet up Tioga Pass to the entrance of Yosemite. 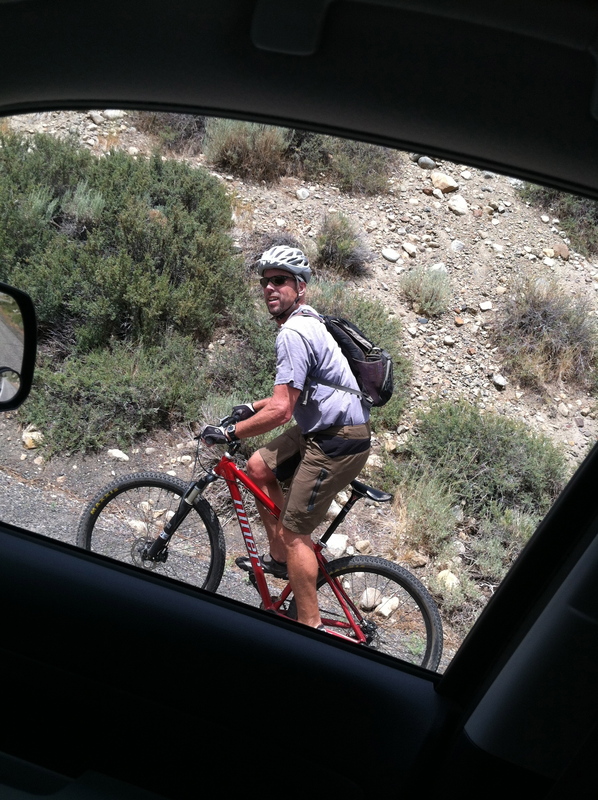 Keep in mind, this is riding a single speed mountain bike, geared 32/19. 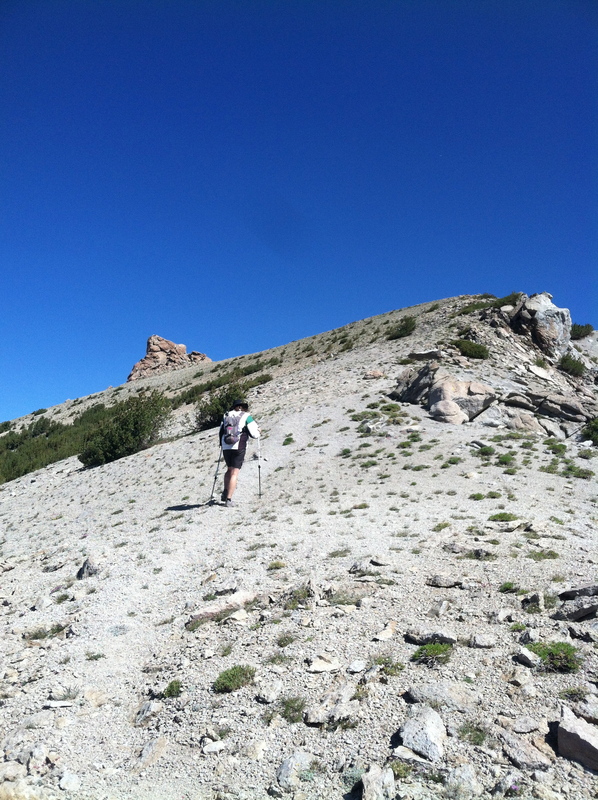 The short story is the Tioga Pass was difficult, but mainly because of the afternoon winds. The head wind was constant, at times at least 30 mph. 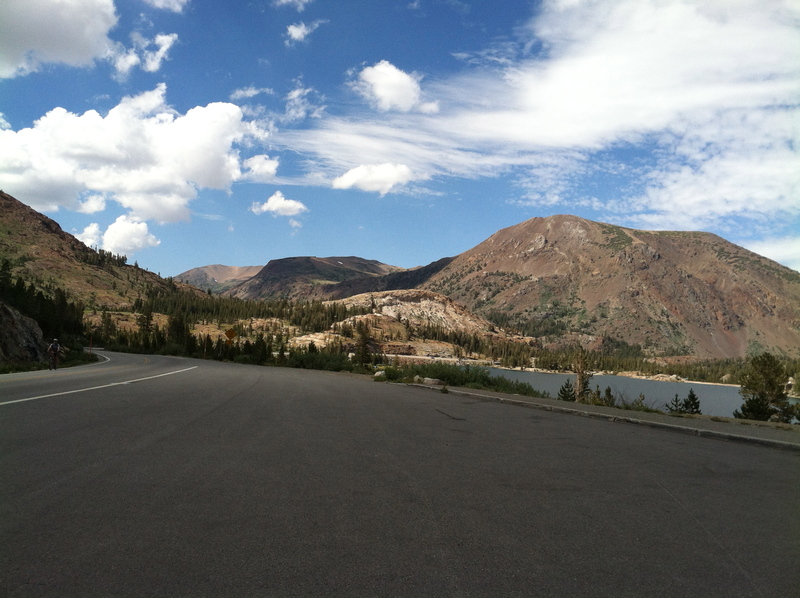 And no, I did not fly down the Tioga Pass. It was scary enough going up it with a small shoulder. 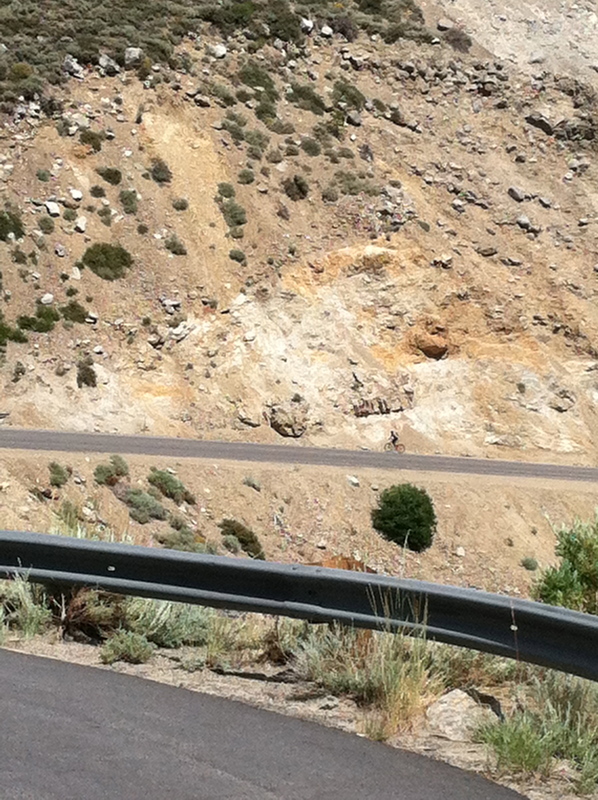 The wind was too crazy and too many cars, besides I think it’s more fun climbing than descending. 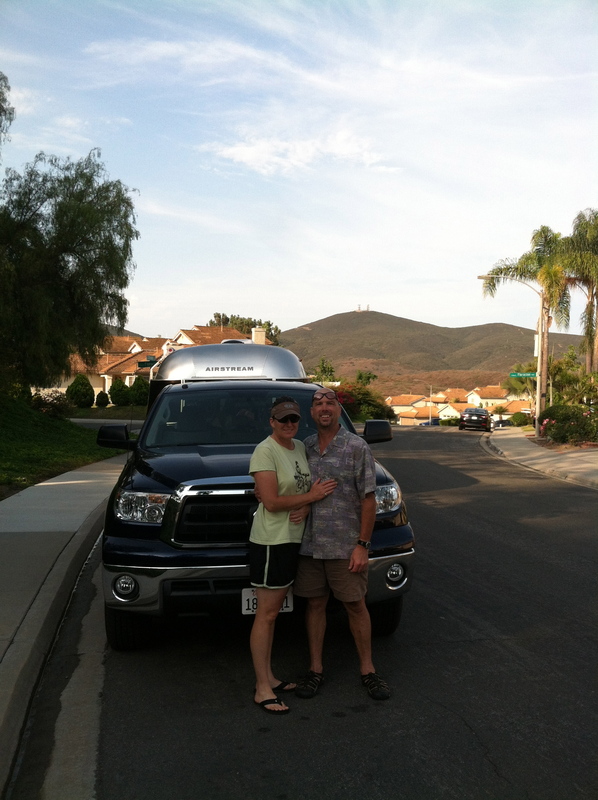 So Amelia drove us back to the Mono Vista in the sag wagon (Toyota Tundra). When the time comes to tackle Horseshoe Meadows, it will definitely be early in the am, hopefully in calm winds, and odds are I’ll switch out the rear cog to a 21. Here are the pictures from July 11th, captions done by Amelia. Enjoy. 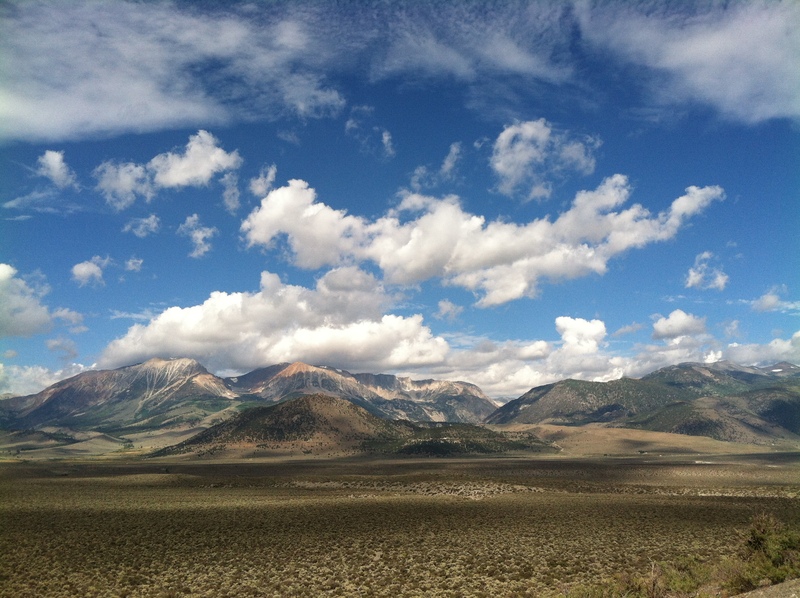 Eastern Sierras from the Panum Crater. Rock formations inside the Panum Crater. 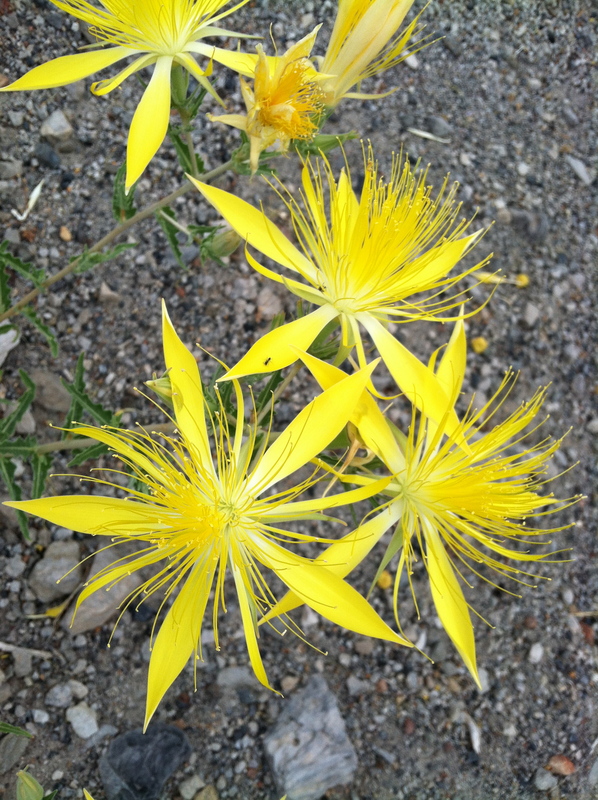 Blazing Star, my favorite flower up here! 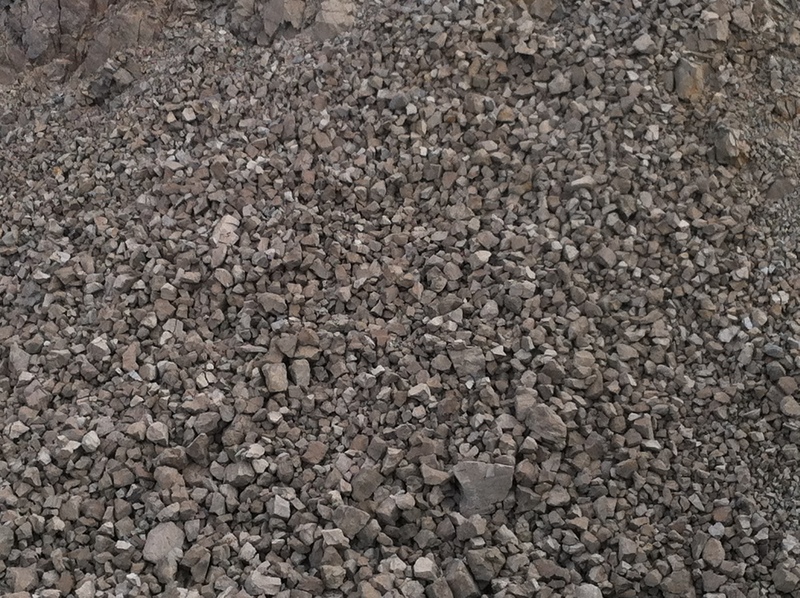 Panum Crater rocks up close…I think we should make a puzzle out of this. 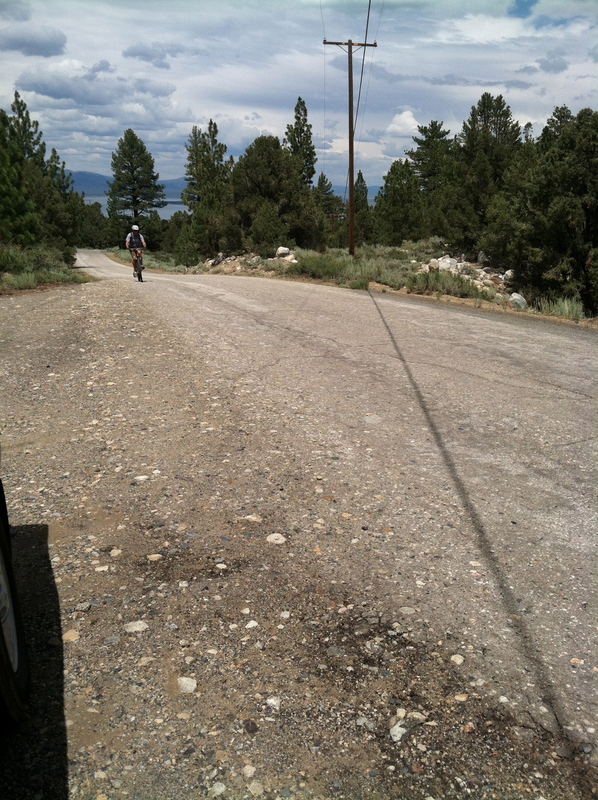 The beginning of the 12.8 mile climb…Utility Road, the road tourists don’t know about…so I wasn’t worried yet. This was before I really saw any cars and I still wasn’t worried. 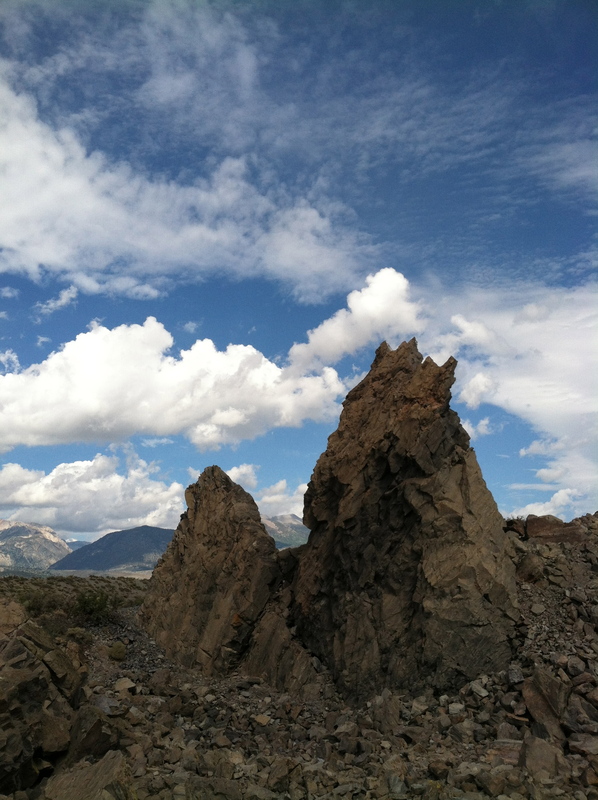 Gorgeous views, but hardly any shoulder…I was starting to fret, but was calm enough to read my book while waiting. As time went on, the shoulder looked smaller and smaller to me and I truly started fretting. That little speck is my crazy husband in a cotton t-shirt in a strong head wind! What was I thinking offering to let him do this ride?! The first break he took and I was really hoping he would be happy with climbing for an hour in the wind, but nooo, he kept going. Beautiful view where I used the facilities and realized, Greg hasn’t stopped to pee! He always stops to pee, as many of you know! He must be dehydrated! My happy husband and relieved wife taking the last picture. Very nice establishment and the best thing, it’s a cash only business! Wow! 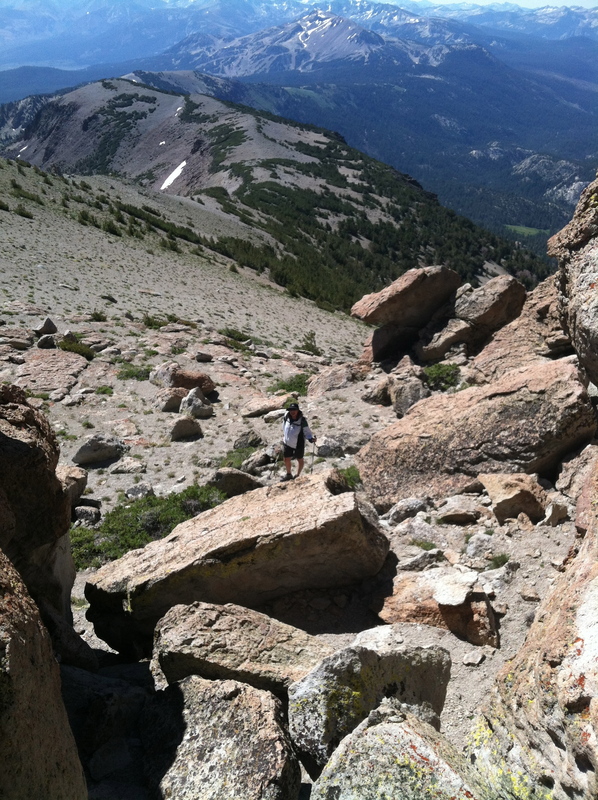 What a difference 8 days makes, this is what we wanted to do last Sunday/Monday at Lone Pine. 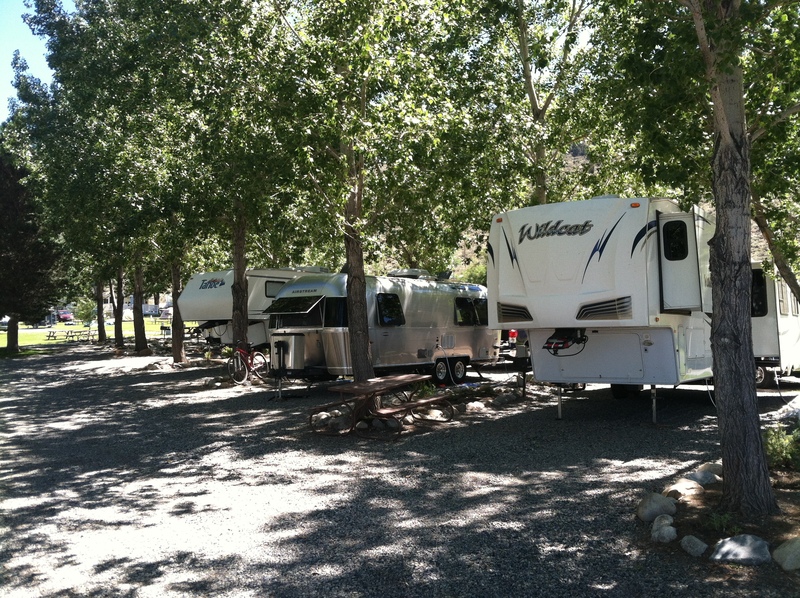 The weather is beautiful and the campground is awesome, and the evening breeze is absolutely heaven. Here are a few observations regarding full hook up campgrounds, keep in mind this is just my second day, and these are generalities. But I’m thinking a year later when I report back on the subject it will be the same. First of all, I swear Harry from the Boulder Creek RV Resort is here at Mono Vista RV Park, driving the same golf cart, smoking the same brand of cigs! Do all the maintenance guys look the same? I think it’s an Eastern Sierra thing, but the Euros are everywhere. I absolutely love it and find it fascinating. I can spot them from a mile away. They are all very nice folk and very distinct. Probably the best description is non-American. I’ll tell you what though, they have a real zest for life and adventure. 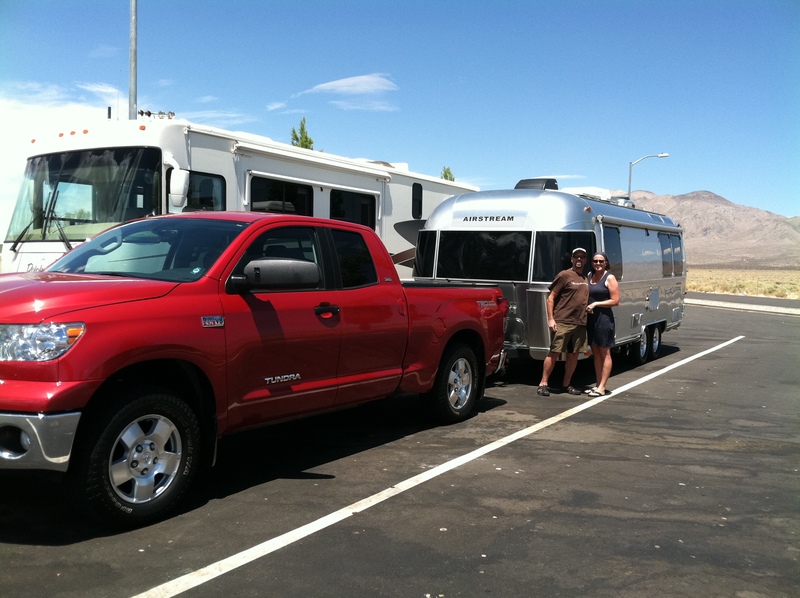 Here’s a quick story about our 5th wheel neighbors. From Arkansas, they have the cutest little Shih-Tzu. The wife walked out of their unit, with a big plastic margarita glass in her hand, and an aseptic pouch of frozen margarita. 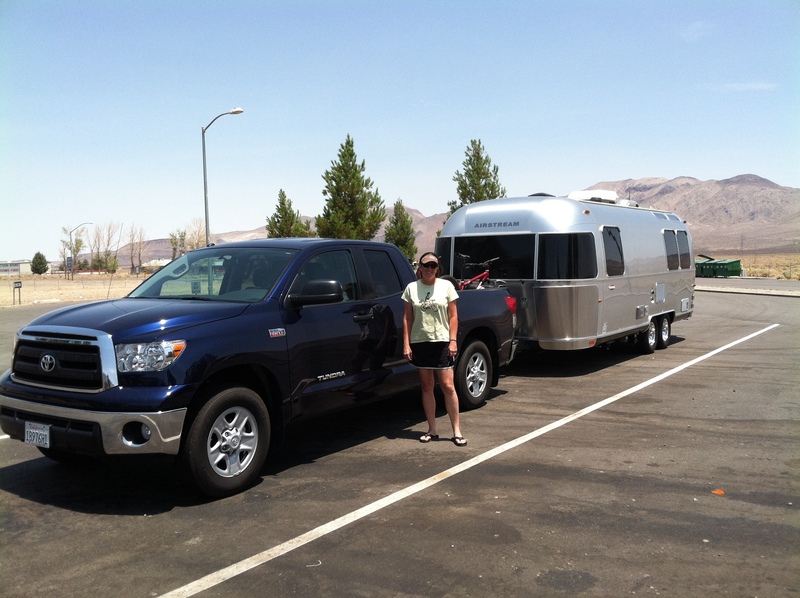 Squeezed it in her glass, and leashed up the dog for a stroll around the RV park. He set up his propane BBQ, opened his storage hatch where he accessed the big box of Almaden red wine, and stuck his big plastic wine glass under the spigot. Life is good! The highlight of the day was our rookie (actually not ours, but my) mistake. 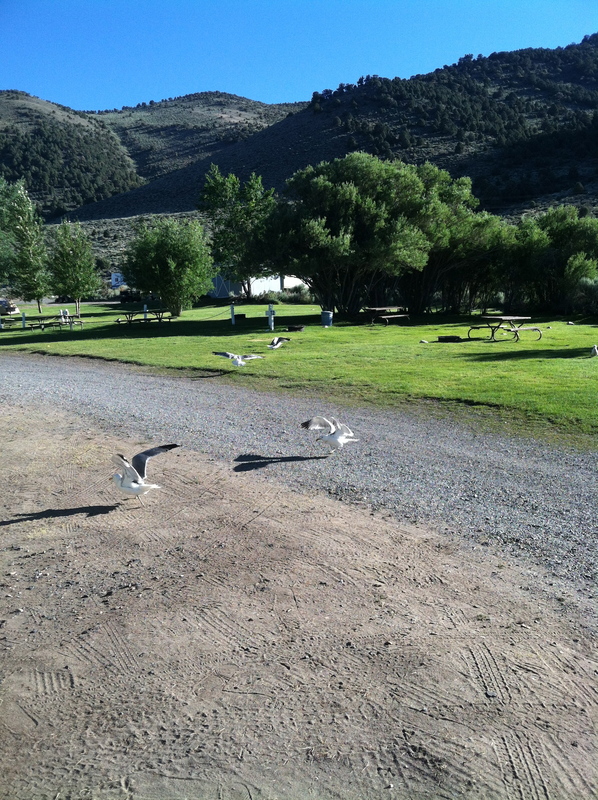 If you are ever in the Mono Lake area look out for the California Gulls!!! I fired up the charcoal BBQ, had the steaks sitting on the picnic table, and was in the head urinating (what a surprise, huh) when Amelia yells, and she’s out the door. One of those damn gulls had a steak in its’ beak! It finally dropped it, no harm, no foul. I zipped up, went outside and put the steaks on the grill, with the cover on! Unfortunately, I’m a slow learner. Two of the three steaks were done, so was the corn on the cob. As I was bringing the corn into the galley, the two cooked steaks were on the picnic table. I came out the door and one of those rat bastards was flying away with a steak!! 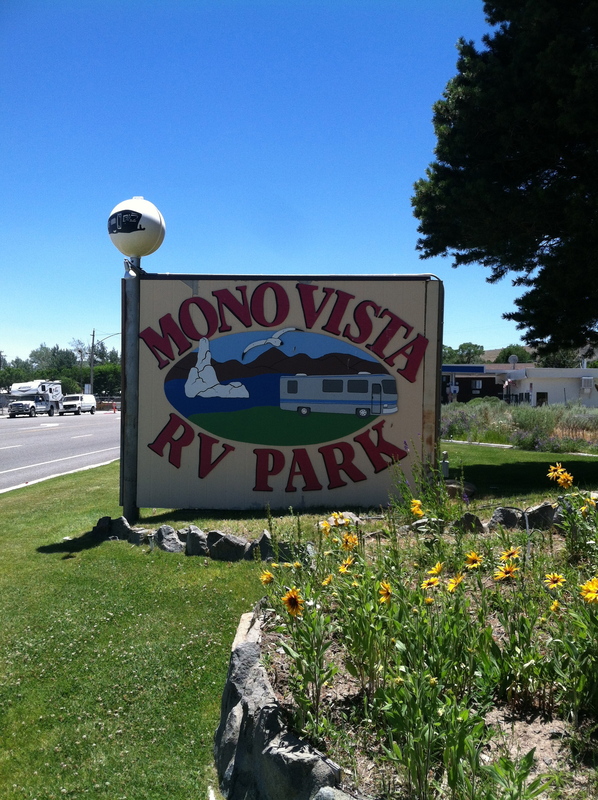 And yes, the Mono Vista Rv Park really has a view of Mono Lake! The boss swinging into our pull through site. 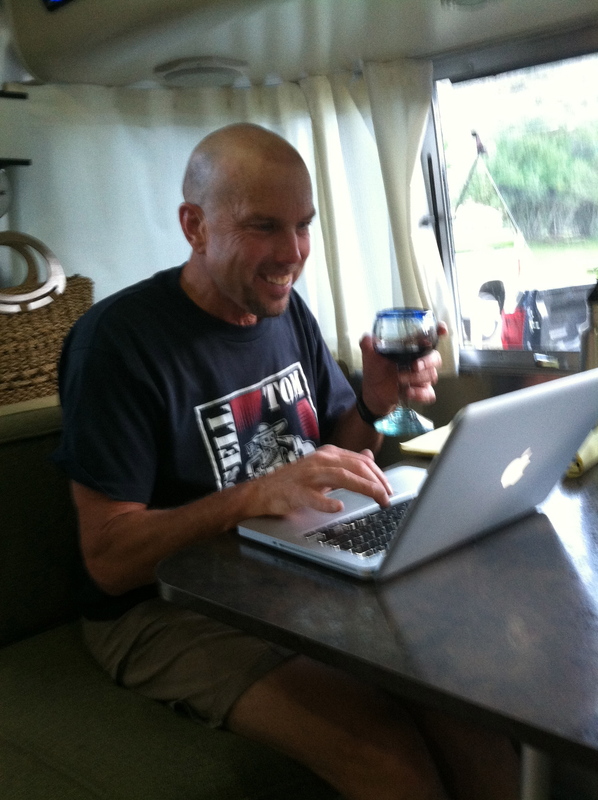 The best looking coach in the whole RV park. 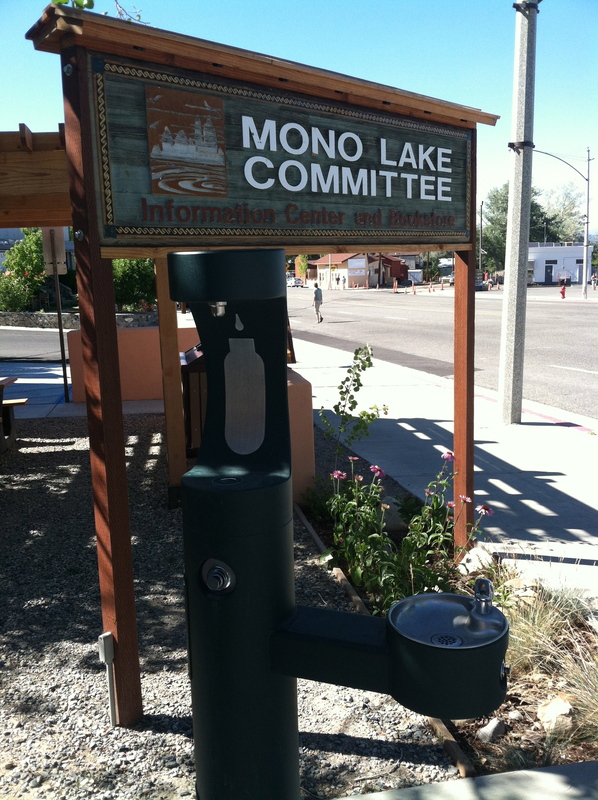 Drinking fountain and a water bottle filling station! 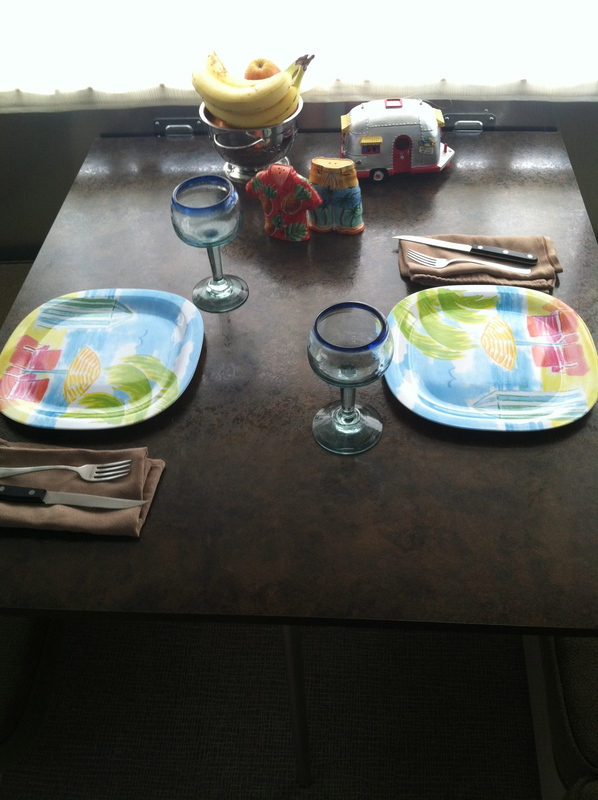 The table is set for our first meal inside. One of these rat bastards has my steak!! I’m sure everyone remembers the old joke about breasts and martinis…I’m here to tell you two teats are perfect! 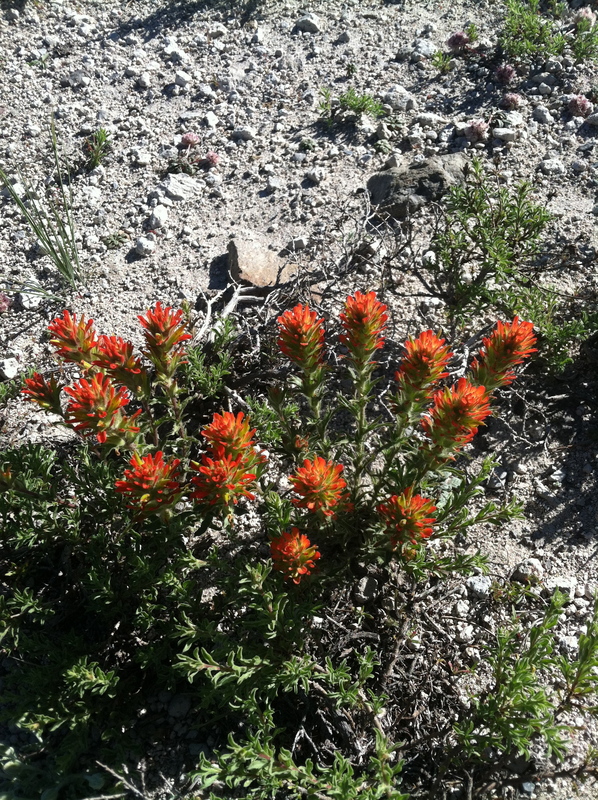 When in Mammoth on the July 4th weekend you have to flee town to beat the crowds. 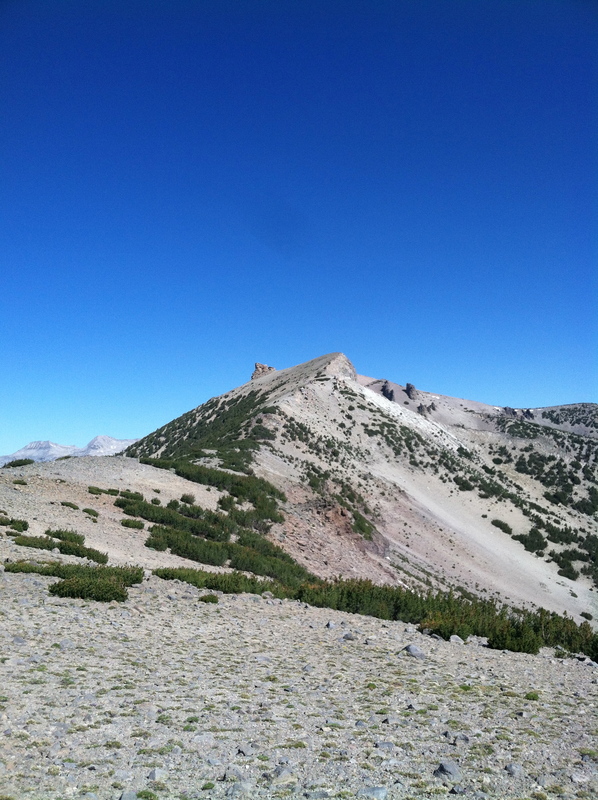 So we 4 x4’d out past the Minaret Summit, to Deadman Pass, and parked where the road ends. 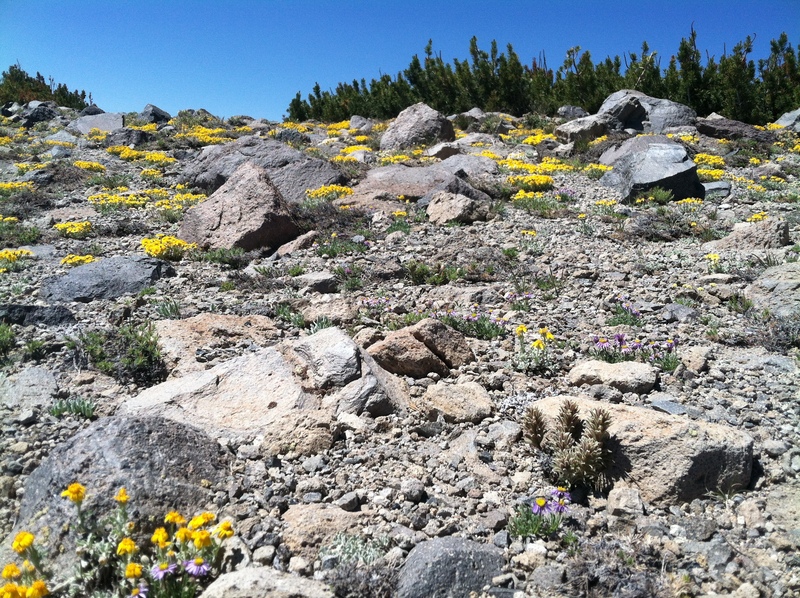 Then we hiked the San Joaquin Ridge all the way to Two Teats (I love saying that!) It was a moderate 4-hour hike and we didn’t see a single soul. 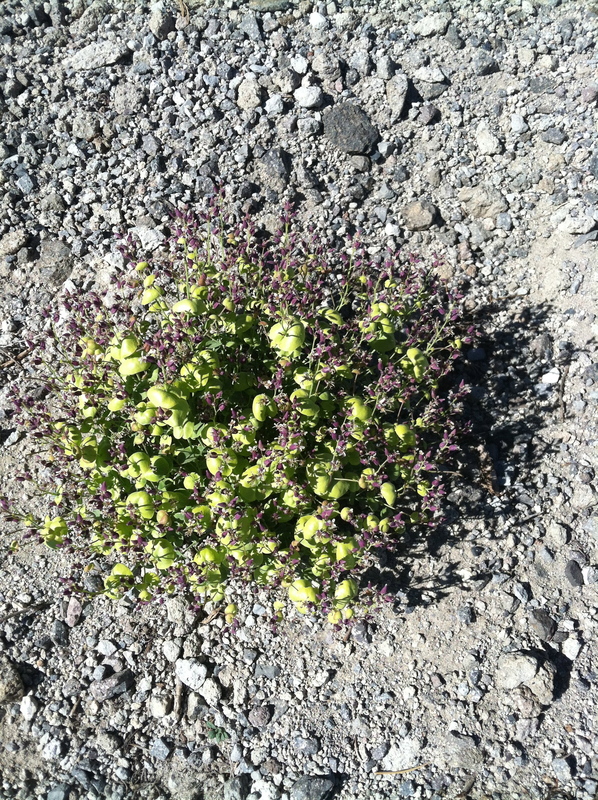 But as one would expect along a ridge line in the Eastern Sierras, it was windy. 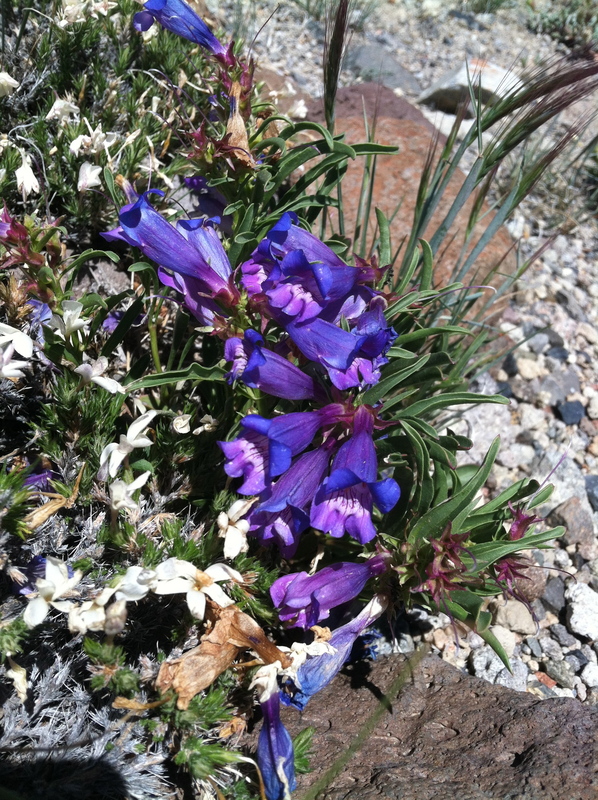 The gorgeous wildflowers were in full display and blue, yellow & black, and orange & black butterflies were flittering about the ridge line. 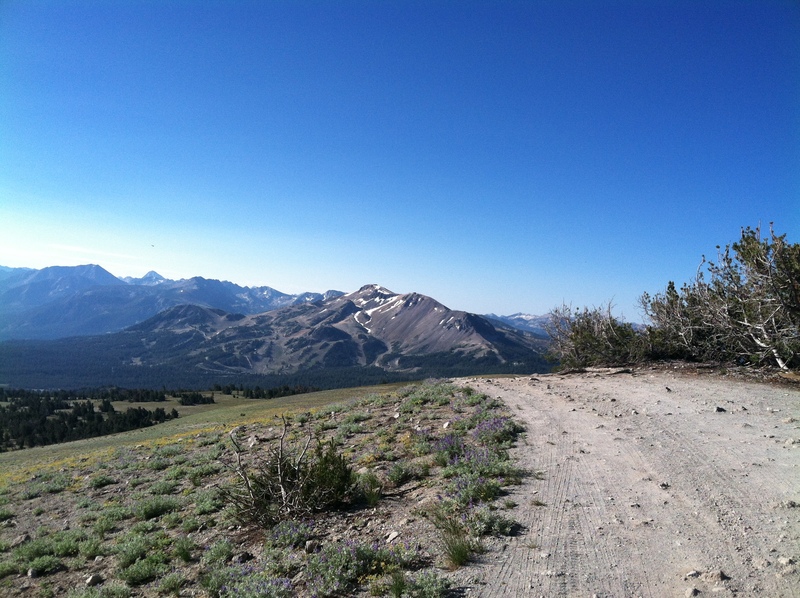 Looking back at Mammoth Mountain from the end of the road. 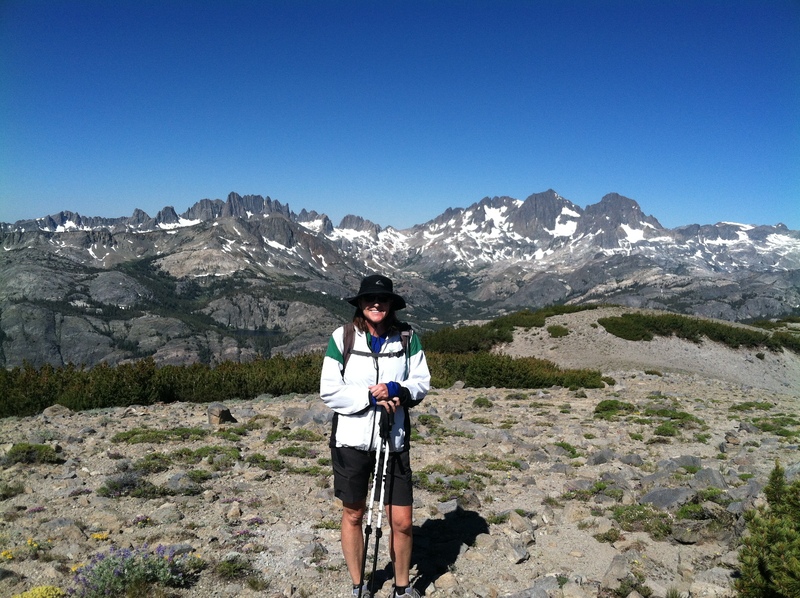 Half way with Minarets, Ritter, and Banner in the background. Coming up on Two Teats. Oh so close to the Teats. One Teat with Ritter and Banner in the background. From the Teat looking all the way along the ridge line back to Mammoth. 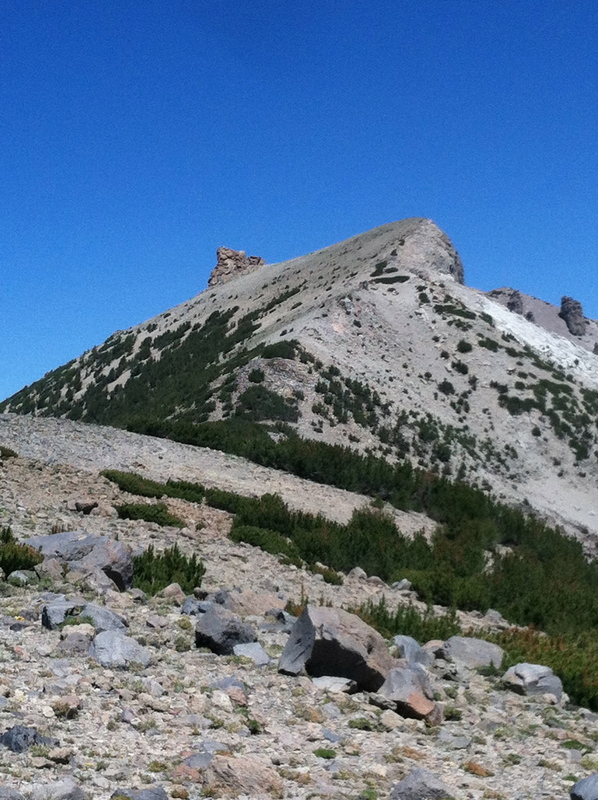 View of the Teat from the trail heading to San Joaquin Mtn. Look how small Amelia appears. The blogger with June Mountain and Glass Creek Meadow behind him. 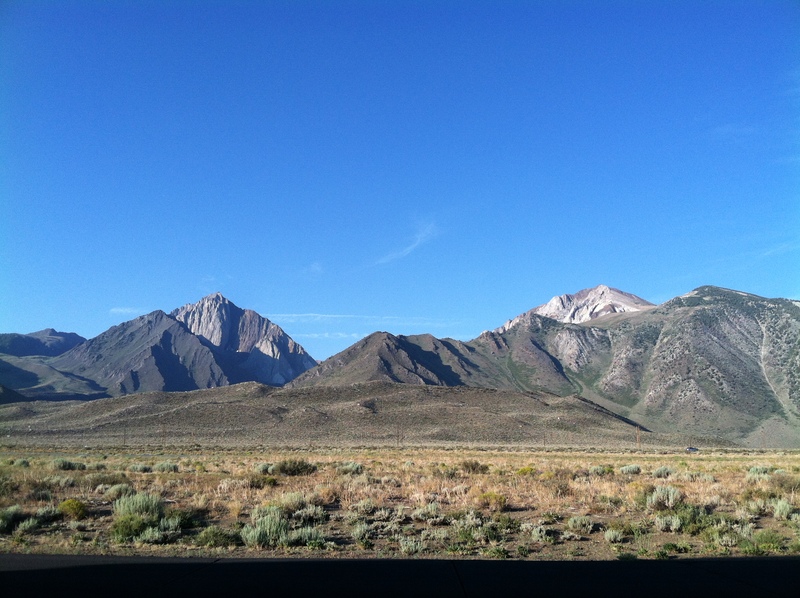 June 30th, the day of our big move to Mammoth Lakes, and the west was in the grips of an oppressive heat wave. 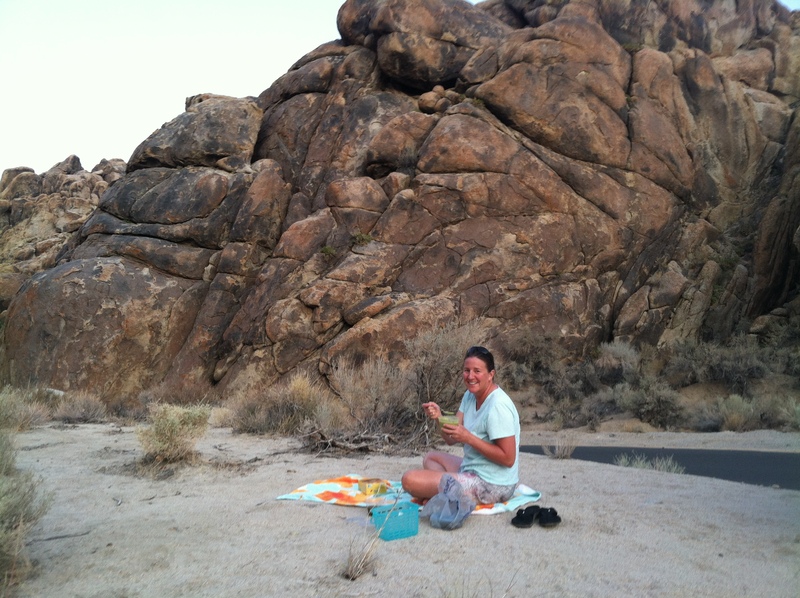 The plan was to spend a couple of nights in Lone Pine at a full hook-up campground, play around in the Alabama Hills and explore Onion Valley, then head to Mammoth. 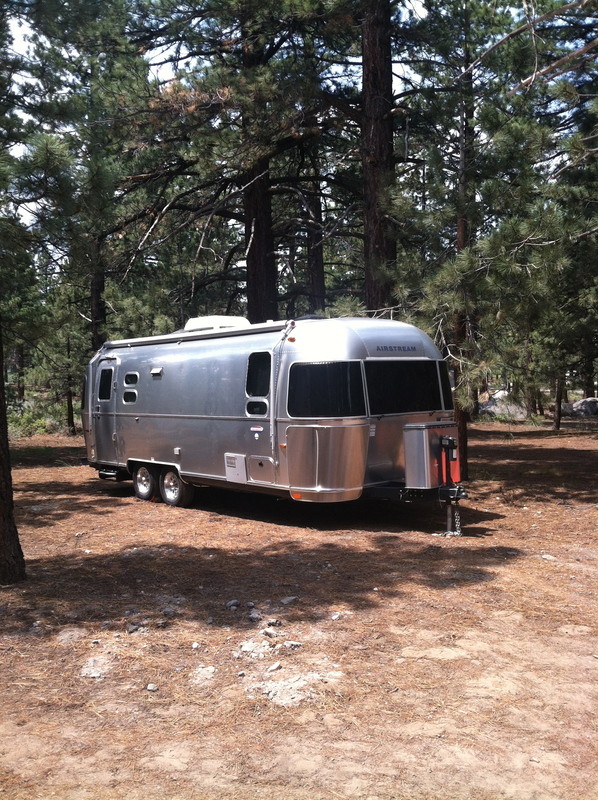 For reasons unknown, the AC kept tripping the breaker, at the source and in the Airstream. 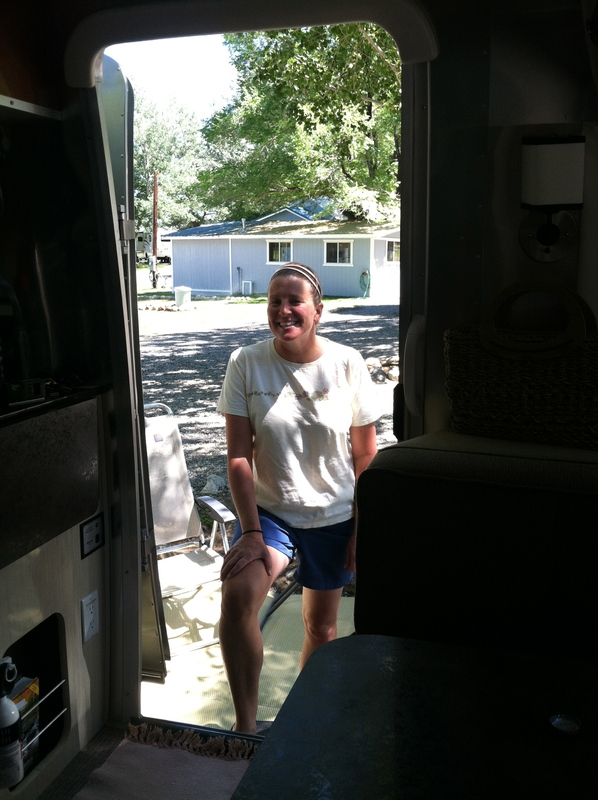 Harry, the campground maintenance guy, was convinced it was because we needed 50 AMP, not 30 AMP. So he loaned us an adaptor. Problem not solved! 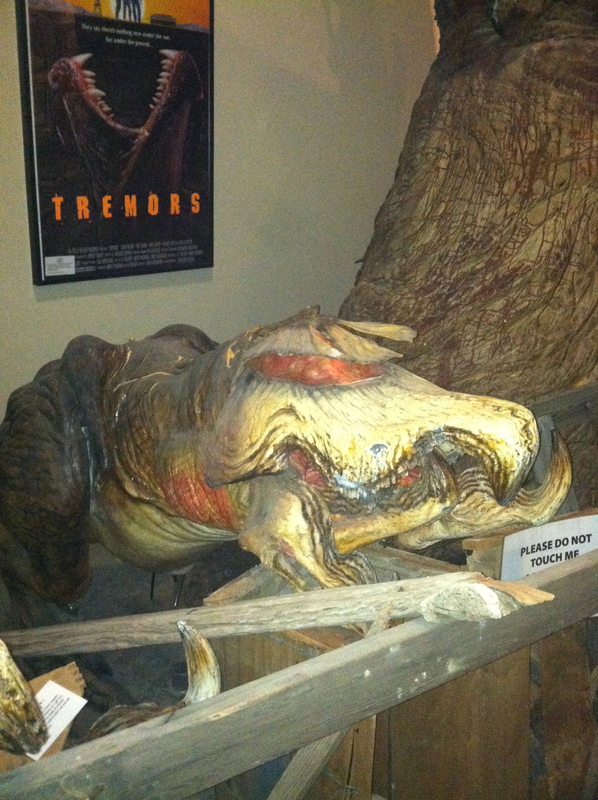 So we opened up all the windows and went into Lone Pine for a long air- conditioned lunch, then to the Lone Pine Film Museum. Back to the campground, the temperature was still rising, so we holed up in the campground rec room, trying to beat the heat. When the mean sun finally began setting behind the Sierra’s, we jumped in the Tundra and took Lubken Canyon Rd into the Alabama Hills. We had never been so excited to see 95 degrees! And 95 degrees had never felt so cool. Everyone, please put Tuttle Creek Rd on your list of must do drives. Access it from Lubken Canyon Rd. It’s an extremely narrow, tight, freshly paved, windy up and down 3 mile amazing road, and even more amazing flying down it on a single speed, which I did as Amelia followed me in the truck. After flying down Tuttle Creek Rd I knew our luck was turning, sure enough when we got back to the campground, it was 98 degrees. So I figured let’s try the AC one more time. It fired up and ran all through the night!! Hallelujah! The next morning we woke up and hightailed it out of Dante’s Inferno and headed to our new home at 8,000 feet in Mammoth Lakes. 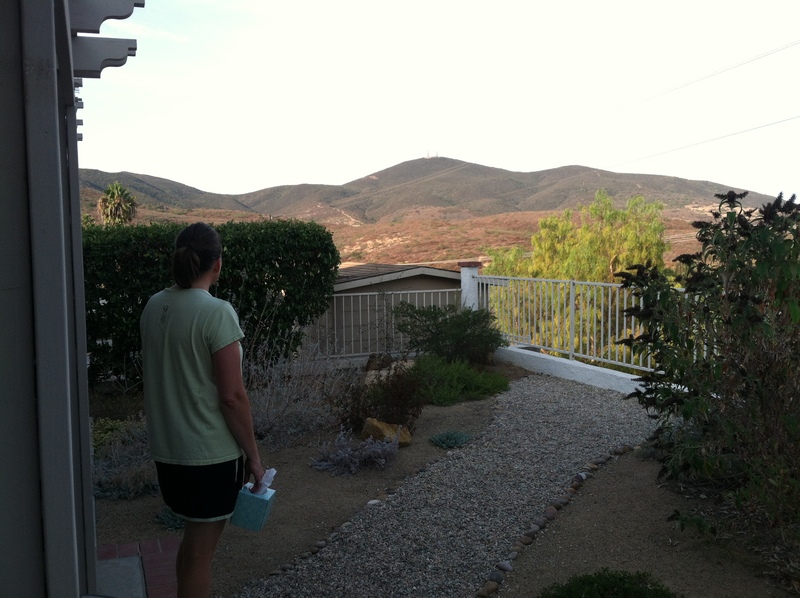 Amelia saying goodbye to the beautiful view from our backyard. 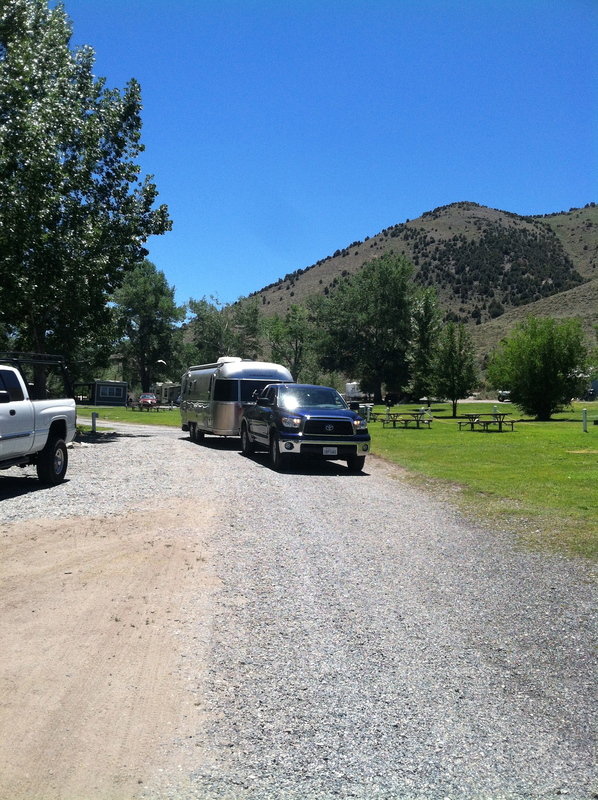 Coso Junction, almost a year to the date earlier, in front of Roger and Gail’s Airstream. 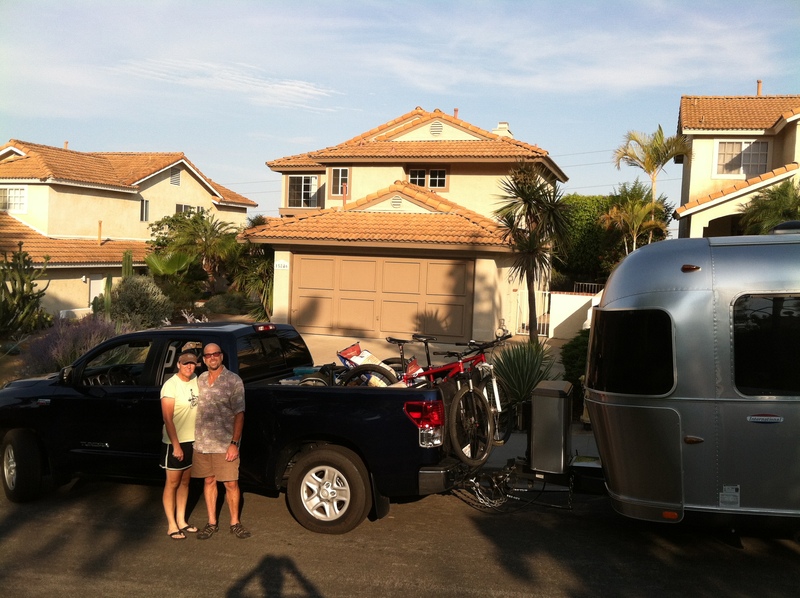 We became fast friends with them after accosting them in the parking lot on their maiden voyage in their new Airstream. Boulder Creek, in the last 20 plus years I’ve driven by this place at least 200 times, I just may drive by it another 200 times before I stop again! 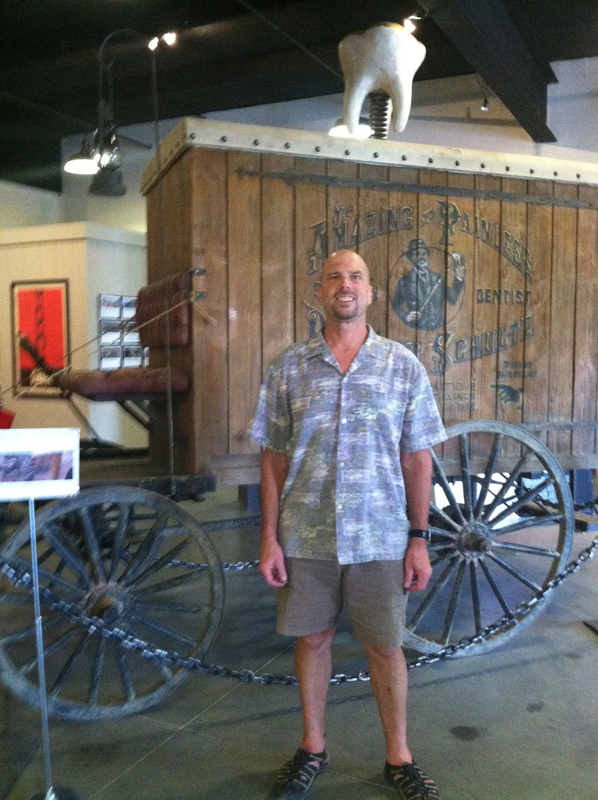 The dentist wagon from Django Unchained, on display at the Lone Pine Film Museum. 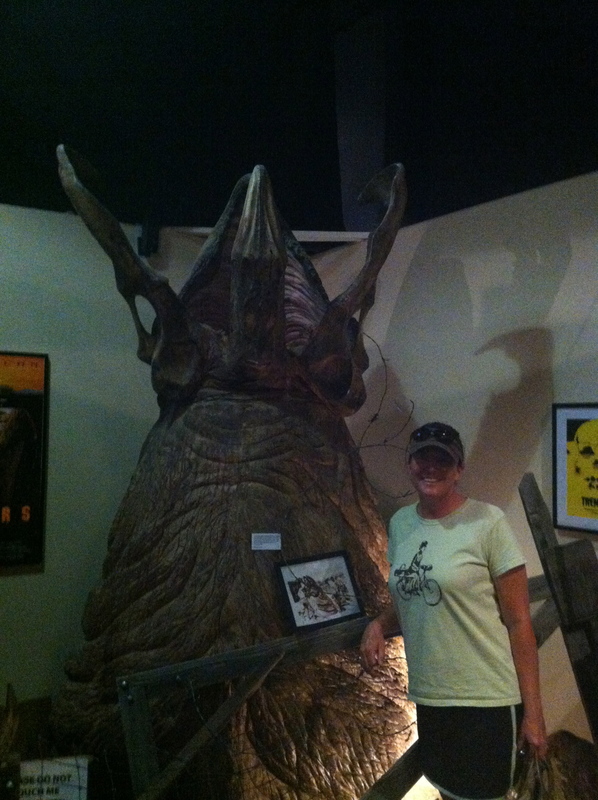 Right from the movie Tremors, filmed in the Alabama Hills. 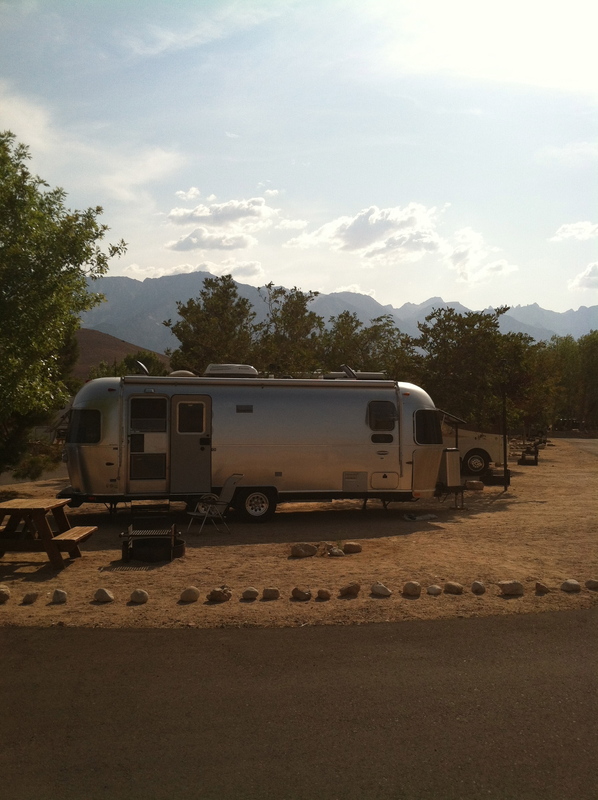 Sweltering heat outside the Airstream, but a nice spot once the sun went down. 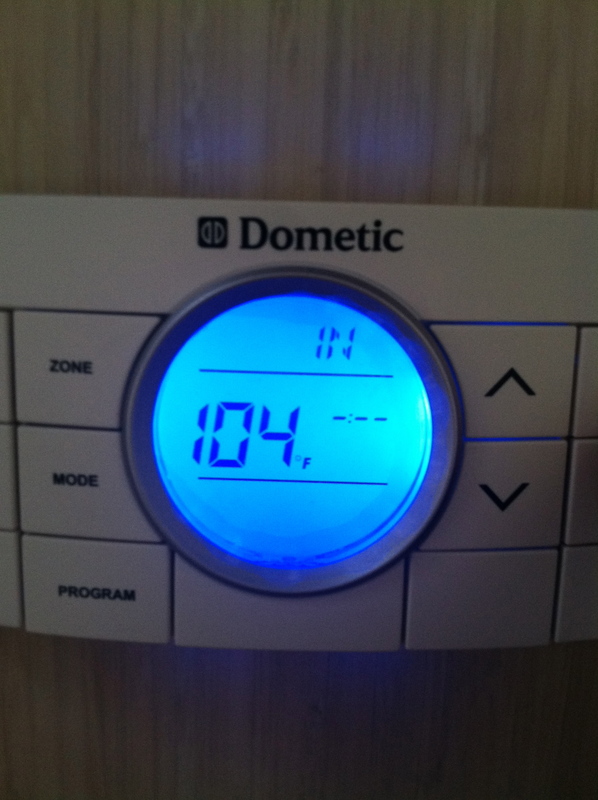 Sweltering heat inside the Airstream. Evening picnic spot on Tuttle Creek Rd.